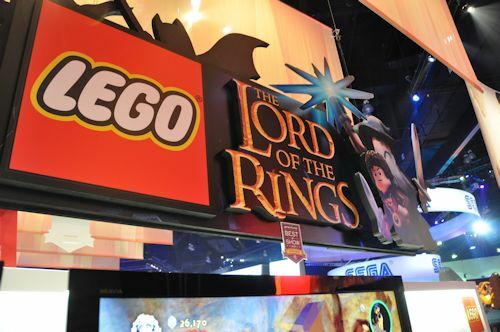 In a simultaneous LEGO series first, both titles feature voice acting. LEGO LoTR might seem to take itself a little too seriously at first, since it directly uses dialogue samples from the films, but the familiar silliness sets in during the cutscenes, keeping things light and kid-friendly. Nick and I jumped in and played through a scenario based on the Cave Troll encounter in the Mines of Moria, and we had to lure him into several points of the environment to try and get him to swing his ball and chain at certain points, causing it to stick to the ground. Once we were able to get his focus off of us, I could swap into Legolas and shoot arrows at his face. Eventually, he wises up to our tactic and we had to switch to the smaller Hobbits (who could crawl into tight spaces and get to high ground), which let us jump on his back. Nick started stabbing him in the back, which stuns the troll for long enough for me to pop back into Legolas and shoot him in the face one last time. 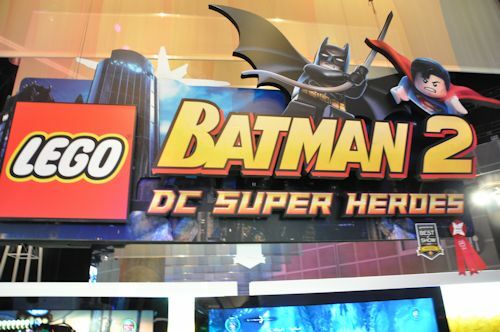 LEGO Batman 2: DC Super Heroes continues the adventures of the Caped Crusader, but this time, a wide selection of DC Comics characters are also available for play, and there's a bit of open world gameplay on display. We battled the Joker in our demo, (I couldn't tell since the show floor was so loud, but I'm pretty sure I detected a Mark Hamill performance) and he had Batman and Robin pinned down. We needed to search the environment for parts to build a cannon, which disabled the Joker's vehicle. Unfortunately for us, he was able to call for backup, who we needed to take out using Robin's suction cups to pry open the new vehicle's engine bay. We then climbed the building in the background to get us the necessary parts to build a giant hammer, which we dropped on the Joker's head, taking him out for good. Both titles seemed like solid continuations of the LEGO series. Hopefully, the combination of voice acting and the new open world elements in LEGO Batman 2 will keep things fresh.